Eudora Alice Welty, the oldest of her family's three children and the only girl, was born on April 13, 1909, in Jackson, Mississippi. That neither of her parents came from the Deep South may have given her some detachment from her culture and helped her become a careful observer of its manners. Her father, Christian Welty, had been raised on a farm in Ohio and had become a country school teacher in West Virginia. Marrying a fellow teacher, Chestina Andrews, he moved to Jackson to improve his fortunes by entering business. From bookkeeper in an insurance company, he eventually advanced to president. Welty described hers as a happy childhood in a close-knit, bookish family. One of her earliest memories was the sound of her parents' voices reading favorite books to one another in the evenings. Welty's education in the Jackson schools was followed by two years at Mississippi State College for Women between 1925 and 1927, and then by two more years at the University of Wisconsin and a bachelor of arts degree in 1929. Her father, who believed that she could never earn a living by writing stories, encouraged her to study advertising at the Columbia University Graduate School of Business in New York City during 1930 and 1931. The years in Wisconsin and New York broadened Welty's horizons, and the time she spent in New York City was especially meaningful for it was during the peak of The Harlem Renaissance, an artistic awakening that produced many African American artists. Welty and her friends went to dances in Harlem clubs and to musical and theatrical performances all over the city. in the journal Manuscript, and within two years her work had appeared in such respected publications as the Atlantic and the Southern Review. Critical response to Welty's first collection of stories, A Curtain of Green (1941), was highly favorable, with many commentators predicting that a first performance so impressive would no doubt lead to even greater achievements. Yet when The Wide Net, and Other Stories was published two years later, critics were split as some praised the work and others slammed it. As Welty continued to develop her vision her fictional techniques gained wider acceptance. Indeed, her most complex and highly symbolic collection of stories, The Golden Apples, won critical acclaim, and she received a number of prizes and awards throughout the following decade, including the William Dean Howells Medal of the Academy of Arts and Letters for her novella The Ponder Heart (1954). Occupied primarily with teaching, traveling, and lecturing between 1955 and 1970, Welty produced little fiction. These were years of personal difficulty, as she nursed her mother through a long fatal illness and lost both of her brothers. She was nevertheless at work on long projects, notably Losing Battles, which she continued to shape for a decade. Then, in the early 1970s, she published two novels, Losing Battles (1970), which received mixed reviews, and the more critically successful The Optimist's Daughter (1972), which won a Pulitzer Prize. Although Welty had published no new volumes of short stories since The Bride of Innisfallen in 1955, the release of her Collected Stories in 1980 renewed interest in her short fiction and brought all-around praise. In addition, the 1984 publication of Welty's One Writer's Beginnings, an autobiographical (having to do with a book written about oneself) work describing her own artistic development, further clarified her work and inspired critics to reinterpret many of her stories. She continued to protect the essential privacy of her daily life, however, by discouraging biographic inquiries, carefully screening interviews, and devoting most of her energies to her work. During the later 1970s this work consisted largely of collecting her nonfiction writings for publication as The Eye of the Story and of assembling her short stories as The Collected Stories of Eudora Welty. With these two important collections she rounded out the shape of her life's work in literary commentary and fiction. An invitation to give a series of lectures at Harvard in 1983 resulted in the three autobiographical pieces published as One Writer's Beginnings the next year. Perhaps because she wished to forestall (keep away) potential biographers or because she came to accept public interest in a writer's early experiences in shaping her vision, Welty provided in One Writer's Beginnings a recreation of the world that nourished her own imagination. Characteristically, however, she left out family difficulties and other personal matters, focusing instead on the family love of books and storytelling, the values and examples her parents provided, and the physical sensations of life in Jackson that influenced her literary sensitivities. Welty's fictional chronicle of Mississippi life adds a major comic vision to American literature, a vision that supports the power of community and family life and at the same time explores the need for peace. In his 1944 essay, Robert Penn Warren (1905–1989) identifies these twin themes in Welty's work as love and separateness. While much of modern American fiction has focused on isolation and the failure of love, Welty's stories show how tolerance and generosity allow people to adapt to each other's weaknesses and to painful change. Welty's fiction particularly celebrates the love of men and women, the fleeting joys of childhood, and the many dimensions and stages of women's lives. With the publication of The Eye of the Story and The Collected Stories, Eudora Welty achieved the recognition she has long deserved as an important American fiction writer. Her position was confirmed in 1984 when her autobiographical One Writer's Beginnings made the best-seller lists with sales over one hundred thousand copies. During the early decades of her career, she was respected by fellow writers but often dismissed by critics as an oversensitive "feminine" writer. The late 1970s and 1980s, however, saw a critical reevaluation (the act of examining the same thing over again) of her work. In August of 2000, Country Churchyards, with photographs by Welty, excerpts from her previous writings, and new essays by other writers, was published. Welty was inducted into the National Women's Hall of Fame in Seneca Falls, New York, on October 7, 2000. Welty died at the age of ninety-two on July 22, 2001, in Jackson, Mississippi. Aevlin, Albert J. Welty: A Life in Literature. Jackson: University Press of Mississippi, 1987. Carson, Barbara Harrell. Eudora Welty: Two Pictures at Once in Her Frame. Troy, NY: Whitston, 1992. MacNeil, Robert. 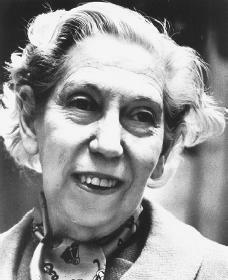 Eudora Welty: Seeing Black and White. Jackson: University of Press of Mississippi, 1990. Welty, Eudora. One Writer's Beginnings. Cambridge, MA: Harvard University Press, 1984.